Where will home prices head this fall? It depends, in large part, on how many more foreclosures are made available for sale, as a new study by LPS Applied Analytics, a real-estate research firm, makes clear. LPS looked at the link between sales of bank-owned foreclosures (known as REO, for real-estate owned) and the rate of home price declines. In Michigan, for example, REO accounted for 64% of sales in the first half of 2009. Home prices declined by 47% over that time, though the decline falls to just 26% when excluding REO properties. If the share of foreclosure sales increase later this year–as banks complete efforts to modify loans and as fewer traditional sellers put their homes on the market–that could generate even larger price declines. One sobering conclusion from the study: fewer homes sold in the first half of the year compared to previous years in several states, even as the share of REO sales more than doubled. 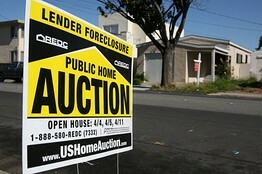 States that haven’t had as many foreclosures have seen less severe price declines, according to the LPS study. In Massachusetts, for example, REO sales accounted for 14% of all sales in the first half of 2009. Overall, prices fell by 19% in the state, and after excluding REO sales, prices were down by 15%.